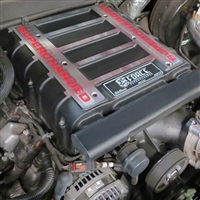 Edelbrock E-Force Supercharger delivers excellent horsepower and torque in a complete, street-legal kit that fits under a factory hood. Integrated into the intake manifold - seamless design, minimal components, eliminating the possibility of vacuum leaks. Edelbrocks' inverted supercharger assembly is uniquely oriented, allowing an incredible amount of intake runner length - maximizing low end torque. The Edelbrock E-Force Superchargers are designed with maximum flow, minimum temperature rise and quiet operation for excellent drivability. Fits under a stock hood, available in three performance levels. Supercharger Kits In Stock · New EFI Systems Available · Made in the USA · Ford · Chevy · Chrysler · Supercharger Types: Street, Track, Professional Tuner · Buy Your Edelbrock E-Force Supercharger Kit.